If you are interested in getting trained individually or in a group, JobsatExcel offers the most affordable training courses in a central Dublin location. All courses are done by a registered and certified trainer with certificates of completion issued on the day. Contact info@futureprooftraining.ie for more information and to register your interest. 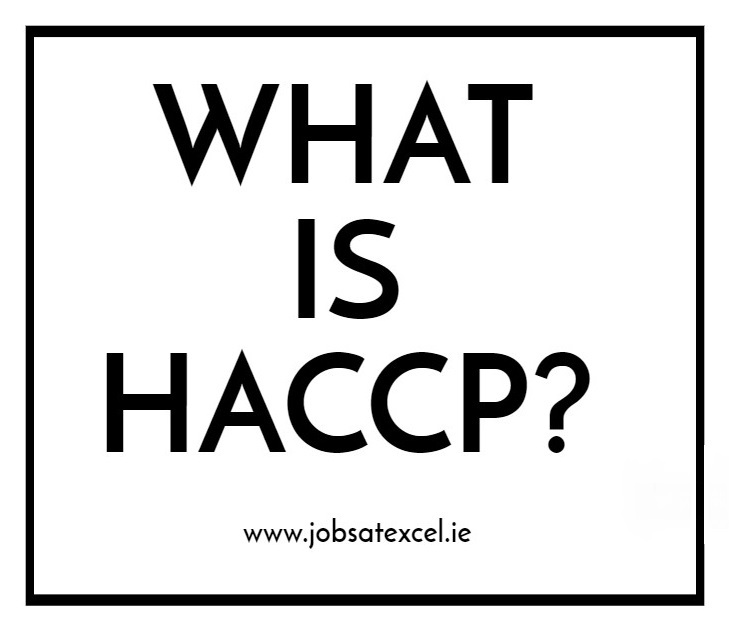 HACCP stands for Hazard Analysis Critical Control Point. It is a system that identifies where and when hazards may occur along food production and processing. HACCP puts into place action to take to prevent hazards from happening. What are the seven principles of HACCP? Look at each step along the production line and food processing to identify potential hazards that may occur. This includes purchasing, delivery, storage, chilling, preparation and cooking and all the possibilities that could occur and go wrong. This include biological, physical and chemical hazards like salmonella and cross contamination. Critical Control Points are regarded as steps or procedures along the process/production that can be applied and as a result a food safety hazard can be prevented, or reduced to an acceptable level. A Food Safety Hazard is any biological, chemical or physical property that may cause food to be unsafe for consumption. Set limits to which allow you to identify when a critical control point is eliminated. This point is the minimum or maximum value in which a physical, biological or chemical hazard can be prevented or made safe to an acceptable level. Monitoring ensures that processes are under control under each identified CCP. This step ensures that CCP’s and critical limits have been identified, they are monitored and recorded. This will depend on the size and type of business you have/work in. An example: Probe refrigerated food to ensure that it is being maintained below 5°C. When monitoring indicates that a particular Critical Control Point is not under control, corrective action must be taken. Review and correct the system whenever you make changes to your operations. 7. Establish procedures for verifying the HACCP system is working as intended. A successful HACCP plan will have the verification to prove its effectiveness. Verification procedures will include HACCP plans, CCP records and critical limits. Appropriate documentation and records must be kept and be readily available, with the complexity and length of HACCP records depending on the business. What Is A Critical Limit? A Critical Limit is a maximum or minimum value to which a biological, chemical or physical parameter must be controlled at CCP, to prevent, eliminate or reduce to an acceptable level.